Hey – wanna know the backstory about how Leatherface became Leatherface? Me either! But like it or not, here we are with the prequel of all Texas Chainsaw Massacre prequels – directed by a duo that I’m actually quite fond of (Julien Maury and Alexandre Bustillo). The meat of the story (haha – meat) revolves around a bunch of characters we don’t really care about (including a young Leatherface hidden in the mix) that go on a killing spree, all while being hunted by a vengeful ranger played by Stephen Dorff. I dug the practical effects that enhanced the violence (and there is a lot of it) and I also dug the ‘not so happy ending’. Aside from that, the first hour was boooooring and I honestly cared less and less about how Leatherface became the ‘skin mask wearing chainsaw enthusiast’ that he is famous for being today. Some good visuals and decent acting. The rest? Buzz off. Chucky. The Chuckster. Chuckwick. Bushwick Bill appreciation. Yes, our favorite Good Guys doll Chucky is back! And he has some Good Guys company too (with bad haircuts to boot). 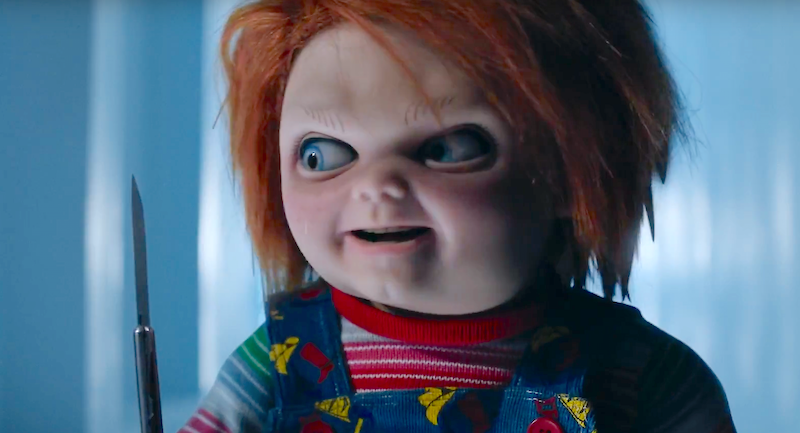 Don Mancini is back to write and direct Cult Of Chucky, a sequel to 2013’s Curse Of Chucky – which was actually pretty fun. Back is Fiona Dourif as Nica, now institutionalized (all I wanted was a Pepsi!) after being framed for Chucky’s murders in the previous film. Also back is Alex Vincent as Andy Barclay (all growns-up) and Jennifer Tilly (plus chest) replaying her Tiffany role. Chaos ensues inside the institution as Chucky is loose again, this time with more facial CGI though which is kind of a bummer. The practical blood does flow though, which is the strong point of this installment. It’s fun seeing a lot of the gang back together (watch for the after-credits scene) and Brad Dourif is also back as the voice of our favorite ginger-headed killer doll. But the movie as a whole was……off. Overall – I dug Cult Of Chucky though (minus excessive facial CGI) and I’m onboard for more sequels and more Jennifer Tilly! Carla Gugino is handcuffed to a bed in lingerie. There you go. That’s all you need to know. See it. Oh – and it’s one of the better Stephen King adaptations in the last 20 years that isn’t named IT. I will also say, that there’s a scene in Gerald’s Game that damn near made me pass out. I don’t feel ashamed typing that because it warrants almost passing out. So, see this movie (if you have Netflix right now) and brace yourself. This entry was posted in Review and tagged andy barclay, andy barclay cult of chucky, brad dourif, brad dourif cult of chucky, Carla Gugino, Carla Gugino Gerald's Game, cult of chucky, cult of chucky review, dirty horror, don mancini, don mancini cult of chucky, fiona dourif, fiona dourif curse of chucky, Gerald's Game review, jennifer tilly, jennifer tilly cult of chucky, Julien Maury and Alexandre Bustillo, Julien Maury and Alexandre Bustillo leatherface, leatherface 2017, leatherface 2017 review, leatherface review, stephen dorff, stephen dorff leatherface by Dirty Horror. Bookmark the permalink.